I've been trying to work more routine into my life for things that are important to me. I feel like I miss many opportunities to be who I want to be due to inefficient management of my own life. So, there are some things I'd like to do regularly or build towards, and being reminded with a clear plan on how to go about them simplifies this for me, and improves my chances of getting these things done. I've used a variety of task managers before, but none of them quite provide the flow and feel I want, so with some free time, I've written my own. Here's My Daily. So, the visual design is still primitive, but you can see what it does already. 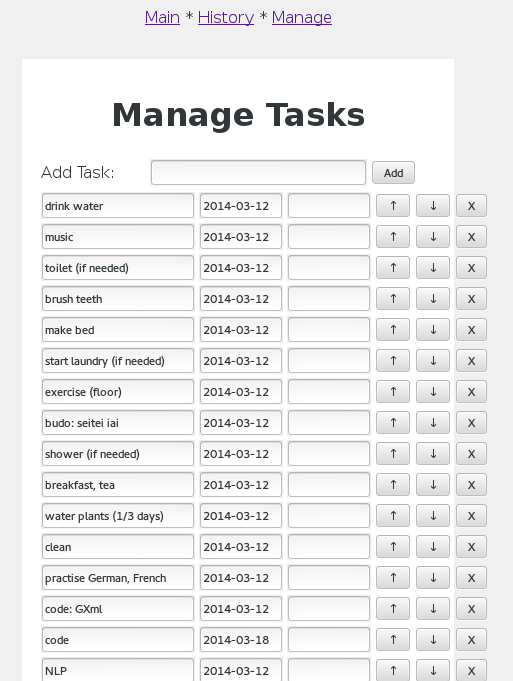 The main page has a list of daily tasks, in a prioritised order. (You can alter the order from the manage page.) It's a simple UI, and you just click anywhere in a row to mark it as completed. You can see that some are labeled "if needed". That's going to be replaced by a delay at some point, where once you've done it, it won't appear again for a couple days. 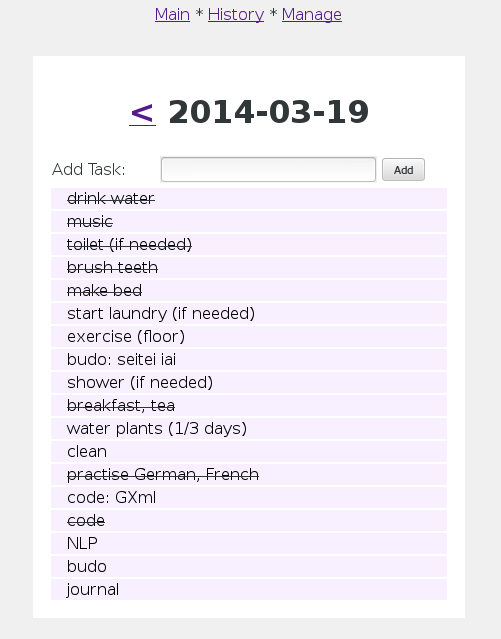 That way, non-daily tasks won't make me feel like I'm lazy for not doing them. You can traverse backwards through time to complete tasks you failed (or just see a day). Here, on the history page, you can see how well I've been doing. 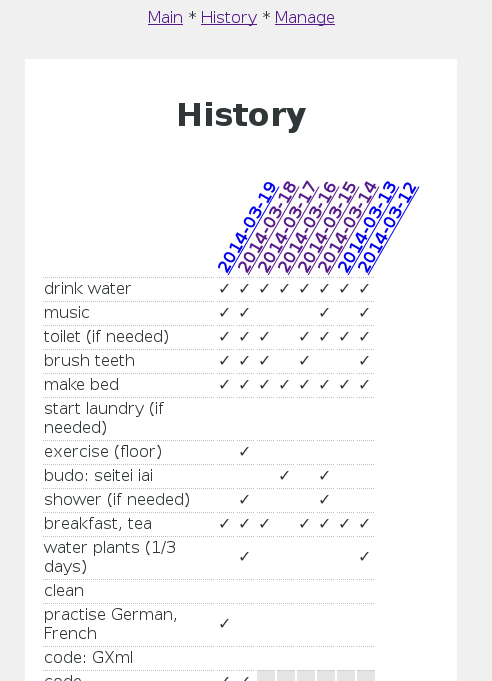 I used some pretty CSS transformation for slanted text, and UTF8 characters for checkmarks. At the bottom, unfortunately cut off, you can see greyed-out cells. My Daily tracks when a task is added (and when it's retired), and periods in which a task did not exist (or was retired) appear in grey (so I won't mistake myself for being lazy). Statistics will be calculated soon. Clicking on a date takes you to the main page, but for that date. There are lots of features to come that don't exist yet. If you like what you see, though, and would like to try using it, I can set you up an instance on my server. Alternatively, I'll be making all the source code available, so I could give you that already. [General] Static writing now has a home!